Detectives Beyond Borders: What turns a good joke into a good story? I asked that question Friday on Facebook, and some fascinating replies ensued. I wanted to know how crime writers make a story work despite an improbable conceit, and also how they make their stories something more than nonstop yukfests. Garbhan Downey, whose novels and stories about Derry in Northern Ireland I've written about often, said: "I just watch the news, then dial it back to something more plausible." 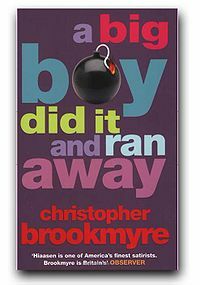 John McFetridge, whose crime novels set in Montreal and Toronto are unmatched in their seamless combination of story, history, and character, has this to say about the wild Christopher Brookmyre: "Lots of humor and some improbable conceits but they do work. Very good character development is the reason why, I think." David Magayna, a big wheel behind Bouchercons, says: "I'd recommend Lawrence Shames and Carl Hiaasen. I believe they make their stories work because among all the absurdity there is enough truth about human nature. ... I think those who do it well, blend it in with the natural elements of the story: plot, setting, character development. I don't think they lead with humor, but incorporate it where they can." "Plot," said David Biemann, to which McFetridge responded, "Yes, I think the plot is important, too. 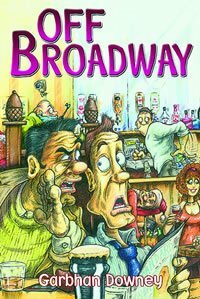 Brookmyre is very good at grounding his characters and plots in mostly believable, everyday stuff so the more improbable conceits don't overwhelm the book." Mary Harris had this to say about Donald Westlake's Dortmunder novels: "The characters, hapless ones in Westlake's case, react to ridiculous situations in a way they think is normal." Travis Richardson mentioned Jim Thompson's great novel Pop. 1280, about which I added that "Everyone mentions Jim Thompson's nightmare visions, but no one seems to talk about his dark, dark humor. What sets Thompson's psychopaths apart is the deadpan way in which they think themselves normal. That can be pretty funny." Elsewhere on this blog, I call Pop. 1280 "Dark, hilarious, a stunning performance that sustains its mood in every word, far and away the best of Thompson's work that I've read." So, good choice, Travis. I asked the question for a personal reason. Several years ago I encountered a series of sights around which I built an improbable and entertaining situation without, however, thinking about turning into a story. Where was the conflict that could turn the funny situation into a funny story? What makes the result a story rather than a drawn-out SNL sketch? The e-mail part of this discussion got me started on the story, and the comments here and on Facebook will stay with me as I write. It gets published, and you'll all get acknowledgments. Thanks, Merry Christmas, Happy Hanukkah, and enjoy the season.